On the surface this story is good news. But read further as I dissect this announcement, the media coverage and wonder what levers were pulled and words tweaked to get there. This “industry benchmark” is suggested by the poultry industry saying, “This is our average. Some better, some worse but on average one out of four packages of chicken parts is contaminated.” The phrase that really means something, because it can have regulatory teeth, is performance standard. However, right now there is no USDA performance standard for chicken parts. In 1996, FSIS set the first performance standards for young chickens (broilers). At that time, the national average for Salmonella on young chickens (broilers) was 20%. Today, the national average of Salmonella on young chickens (broilers) is 7.5%. The performance standard for young chickens (broilers) is not the same for chicken parts. FSIS recently completed the first baseline survey of chicken parts and determined the national average of Salmonella on this product type was 24%. FSIS will use the information gathered in the baseline survey to develop a performance standard for chicken parts. What this means is that until the performance standard for chicken parts is set and violated, often over a few months, there will not be a suggestion for a recall. With whole chickens when you go over 7.5% you are in category 3 danger zone and get extra monitoring. Also, with a few exceptions, the USDA can’t mandate a recall. When they are serious they will do things like remove their approval unless things are fixed. That often triggers a recall, but even that action can be forestalled with the right set of strategies, connections and understanding of the system. The other brilliant part about using “industry benchmark” and setting it at 25% is that it gets people to think 25% is average, so 15% looks good, 7.5% is great and 2% is a heroic miracle. We are all familiar with the Overton Window and the power of word choice in shaping the narrative. It is in the best interests of the industry to start with a high “industry average” so any progress won’t be too hard to show. But note who is driving the bus to use that top line number. Why not take the best number in the industry and demand the others meet it? 2) Lauded by Sen. Dianne Feinstein. I’m really glad I didn’t go to Feinstein’s office to ask why my FOIA request about the lack of a recall on the Foster Farms outbreak was rejected. Now I need to expand it to include Foster Farms’ correspondence with her office. If they won’t provide it, maybe the NSA can. 3) Dr. David Acheson, is now serving as a paid member of the Foster Farms Food Safety Advisory Board. I’m sure Dr. David is a great guy and at least he’s transparent that he is being paid. Anyone else a little queasy? Before I go further I’m going to give a huge tip of the hat to the lobbyists, lawyers, former USDA people and the communications people at Foster Farms. You have protected your industry, client and employer, but what about the chicken eating public? I attempted to find out exactly how and why this Salmonella Heidelberg outbreak didn’t lead to a recall. The power of industry to work the system is almost awe inspiring. If you weren’t a victim of food poisoning, you might agree. 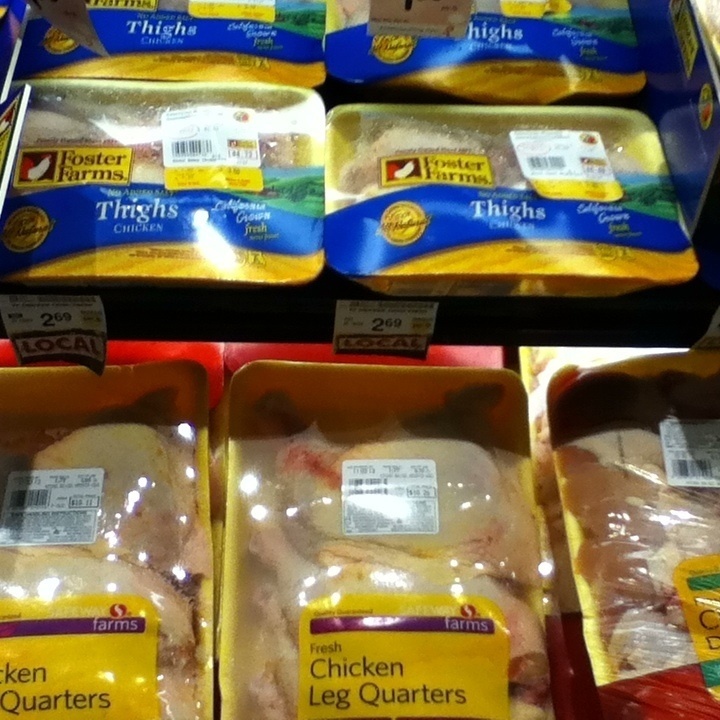 Last year I got sick from eating Salmonella Heidelberg contaminated Safeway Farms chicken parts. I prepared the leg and thighs myself and used my high-end digital thermometer to ensure it was over 165 degrees. Mrs. Spocko was fine. I was sick for seven unsolid days–if you know what I mean. Being a logical person I proceeded to investigate the story to try and find out the reason this happened. What shocked me was that the chicken parts that made me sick were still being sold to the public. There was no recall, just a public warning notice that went up for a week or so at the Safeway customer service counter and the poultry section at Safeway. I was outraged and perplexed at the same time. Although still weak from my week in bed, I decided to hang around the poultry section and explain to people what had happened to me. I convinced three people not to buy the chicken before I got the evil eye from a store manager. Why wasn’t this product recalled? I have been writing about food safety since 2007, following the deaths of thousands of dogs and cats from melamine and knew the USDA. But I couldn’t get the answers I wanted from them so I filled a Freedom of Information Act Request asking for details from the October 2013 outbreak. The information that I was trying to obtain was testing data from certain periods of time and correspondence from Foster Farms to the USDA. I wanted to see if Foster Farms cut some kind of special deal to avoid a recall. I heard nothing until I wrote them again in February when the same Foster Farm plants that shipped out my contaminated chicken were shut down because of cockroaches. At that time they said that my case was “under investigation” and because of that all my requests were denied. What if my request had revealed a smoking gun in the form of a chicken wing? Was there language that said, “We are going to spend 75 million on fixing this, give us time, just don’t make us recall the chicken now?” The public can’t know because of the investigation, during which time the contaminated food kept shipping. I wonder if maybe the USDA itself is under investigation? The DoJ won’t talk until they have a case. On the other hand the reasons might have been more subtle. I came across a brilliant article by Robert Holly from the Midwest Center for Investigative reporting. It enlightened me to an industry pressure that could have held up a recall. He quotes Dan Engeljohn, assistant administrator for the Food Safety and Inspection Service Office of Field Operations, talking about how they were unable to pin down a particular production lot the product came from. “We don’t have a specific establishment that produced that product on a specific day,” said Engeljohn. Officials from the agency need to find such a strong connection before pulling product because, if they do not, they become vulnerable to lawsuits, such as the infamous Supreme Beef Lawsuit from the 1990s. I’ll end this sickening story with a great quote from Rep. Louise Slaughter (D-NY) in Holly’s article. If you eat food please forward this article to people who also eat food to remind them that safe food really is an important role of the government and it too important to let “the market” or “the industry” decide. I need the USDA FSIS people to do their jobs as if my life depends on it. Because it does.